Silk and gold are perhaps the most luxurious and beautiful of hand embroidery mediums, especially when combined. I’ve set out on a commissioned work of ecclesiastical embroidery that will be worked entirely by hand, in silk and gold. I decided to experiment with what is called, in old books from the 1800’s, the “Italian Stitch.” Italian stitch is basically stitching in flat silks (that is, untwisted), and then couching over the stitching with tiny gold passing thread. I wanted to do some test runs before I got underway on the serious work. So far, with this project, I’ve designed the emblem and chosen colors. I prefer to work with Soie Ovale by Au Ver a Soie, which is their flat, untwisted silk. However, Soie Ovale does not come in a large range of colors, and I can’t quite get the shading I would like. In addition to this, it does tend to be rather expensive. I am convinced it’s the best silk on the market, but …. I need subtle shading for this project, so I may go with Eterna Silks from Yodamo. If you’re looking for Chinese silk, you can order it here, and get a pretty good deal on it. Anyway, I ordered some stranded Eterna Silks to test whether or not I will like them. I’ve used them before – they are high luster silks, but they don’t give the coverage that the Soie Ovale gives. I’ll let you know which silks I go with as this project progresses. Back to the Italian Stitch. Basically, you work long straight stitches (or satin stitches, or long-and-short stitches) in flat silk. Then, using the smallest possible gold passing thread, you couch the gold down over your silks. This helps hold the long stitches in place, it gives longevity to the silk (it won’t get worn from rubbing), and, of course, the gold adds dimension and beauty to the whole piece. 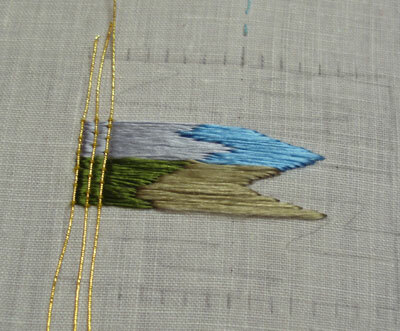 As you lay the silk for this stitch, you might find you need to use a laying tool. The silk should be perfectly flat and untwisted. I wasn’t using a laying tool here, and, with the Soie Ovale, I find I don’t need to as often, but it’s a good idea to have one handy. If you are trying this type of stitch and don’t have a laying tool, you can use a large needle. Run the needle under the length of the thread that will remain on the surface as you pull the thread through and complete the stitch. As I mucked around with it this afternoon, I took a couple photos of the concept, so you can see what I’m talking about. 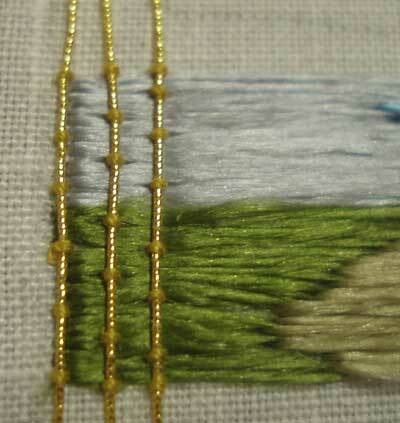 I’m using 2% gold passing thread, size 4, which I ordered from Tanja Berlin. You might wonder why I ordered it from Canada – simply because I can’t seem to find the 2% gold available in the States. (If anyone knows where it can be found, I’m all ears!) Tanja Berlin offers an excellent selection of gold, and the prices are not unreasonable. I prefer the “real gold” for ecclesiastical work, rather than gilt. 2% gold is the highest quantity of gold found in goldwork materials. For my project, the whole background of the piece will be worked in Italian Stitch. In the foreground will be the image of a lamb and banner, the Agnus Dei image often found in ecclesiastical symbols. You can find, for example, a typical image here. The lamb and the banner will stand out from the background, as the couched gold threads will only cover the background area. The lamb will be worked in “wool stitch” (a variation of French knots), with long-and-short stitch needlepainting for the banner, the legs of the lamb, and the face. The halo (or nimbus) around the head of the lamb will be worked in couched gold and red silk. The Italian Stitch varies depending on how the embroiderer wants to use it. For example, the gold could be couched over the silk in swirls and curves, etc., or in lines. I will be couching straight lines, one eighth of an inch apart from each other, as shown in the samples here. After laying each line of gold and couching it at the correct interval, I’ll plunge the threads on the outside of the embroidery. Then I’ll surround the entire design with a 1/2-inch border of gold couching. So that’s my latest “big project” which will probably occupy a lot of my stitching time. October 12, 2012 Old Silk & Goldwork Fragment – Ugly? What a fascinating and clear explanation! I hope you’ll post more as you keep working. Your skills are amazing. Thank you for the information about Italian stitch. 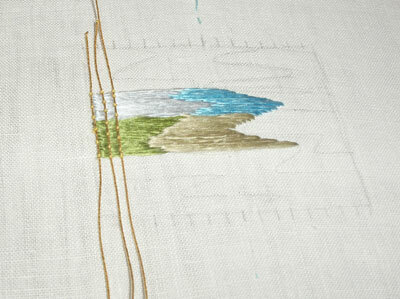 Despite all the reseach I did for the EGA ICC, Silk and Metal Thread Embroidery, I’ve never come across it before. Can you show me any more of it? I didn’t find any by googling. Thanks. Where can i send you a picture about metallic material for golwork. Hi I was wondering if you could teach Italian stitch! I love your blog and your lessons. I would love to draw needlework stitches using a computer but I do not know which software would be a good place to start. Can you help? Would this technique work with cotton and acrylic threads? Hi, Andrew – the technique would work, sure. It won’t look the same, but you can do the same thing with any threads! Hope that helps!